I recently featured a primer on how to make basic risotto, a Northern Italian rice dish. It’s very versatile and is delicious as a base for braises or as a main course dish on it’s own. But what if you have some risotto left over at the end of the meal? Not to worry – it can be transformed into a delicious snack. 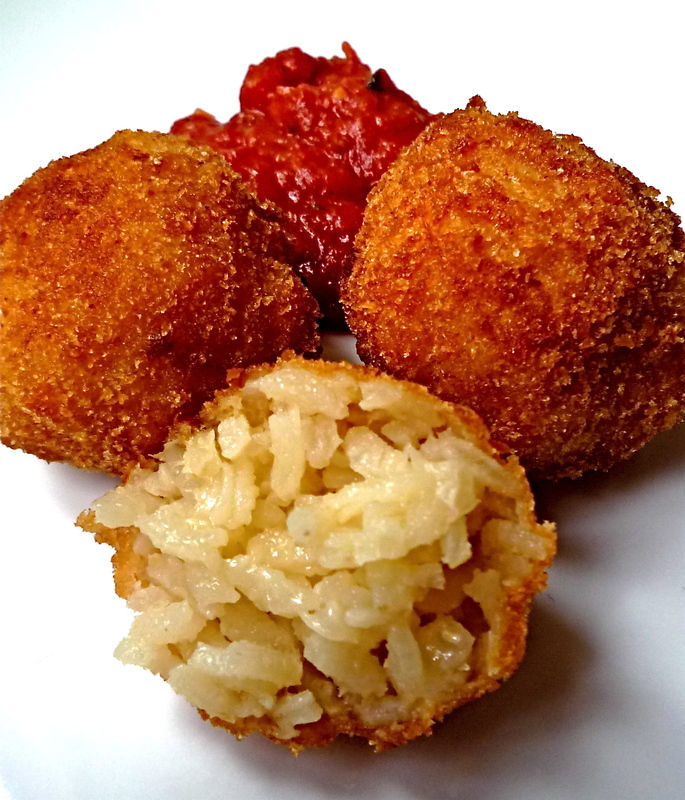 Arancini are small balls of risotto that have been rolled a crumb crust and lightly fried. You can make them with plain or flavoured leftover risotto and I often make a simple tomato sauce to serve with them. I like arancini so much that sometimes I deliberately prepare extra risotto just so I can make them! We’re already at the end of January (yay!) and I’m getting back to the kitchen after a nasty cold and some unpleasant plumbing issues in my basement. I’ve been experimenting with some new recipes and have been inspired by some great restaurants and books in the past month. Last weekend it was raining and cold here so I decided to do a comforting braise served over risotto. Risotto has a reputation for being time consuming and difficult to make but it’s actually very simple if you take it step by step and follow a few pointers. Risotto is a Northern Italian rice dish that is typically creamy tasting with a very slight ‘bite’ to the rice when made properly. Unfortunately, there are a lot of bad examples of risotto out there (it can be difficult for restaurants to do right because it must be made to order). The best restaurant risotti I’ve eaten were a braised oxtail version at XO Le Restaurant in Montreal and a seafood risotto at Imàgo at the Hotel Hassler in Rome. In both instances the rice had a creamy texture and lots of flavour. Although the texture of risotto should be ‘creamy’, no cream or milk is ever added to the rice. Rather, the creaminess is a result of starch being released during cooking. The key to creamy risotto is to use the right kind of rice and to take your time adding the liquid during the cooking process. Regular long grain rice doesn’t work for risotto – you need to use specific types. Carnaroli, Arborio and Vialone Nano rice are most commonly used. I prefer carnaroli rice but arborio is usually more readily available in many areas. Using good quality stock is also important for good risotto. Homemade or a high-quality boxed stock are best (low-sodium is preferable). Many butchers sell tubs of good house made stock as well. If your stock is very strongly flavoured, you may want to cut it with some water so it isn’t too overpowering. I prefer chicken stock for most risotti but it depends on what you are adding to the basic recipe so choose your stock flavour accordingly. This recipe is for a basic risotto which is the foundation for more exotic versions – I have suggested a few variations at the end. However, the possibilities for additions are almost endless so use your imagination! In a large deep skillet or enameled cast iron pot, heat olive oil on medium-high heat. Add onion and cook until translucent, about 5 minutes. Add rice and sauté for another 2 minutes, stirring periodically. Pour in wine and stir rice. Reduce heat and let simmer gently until the wine is completely absorbed, about 3 minutes. Once the wine has completely absorbed, add 1/2 cup of the stock. Let the rice simmer gently, stirring occasionally. Once the stock has almost fully absorbed (about 4 minutes), add another 1/2 cup of the stock. Repeat the process of adding the stock a half cup at a time once it has almost absorbed. Continue until the rice is creamy and cooked through but still has a very slight ‘bite’ in the middle of the grains (al dente). Stir the rice on occasion and keep an eye on it. It will take approximately 7* additions of stock in half cup increments (*Note: the rice may require a little more or less stock, depending on how absorbent it is). Once the rice is cooked to the desired tenderness, remove the pan from the heat and add the butter and parmesan cheese. Stir into the risotto until completely melted. Any additions can be added at this point (see below for suggestions). Season with salt to taste and serve. Mushroom – Sauté mixed mushrooms with herbs such as rosemary and thyme. 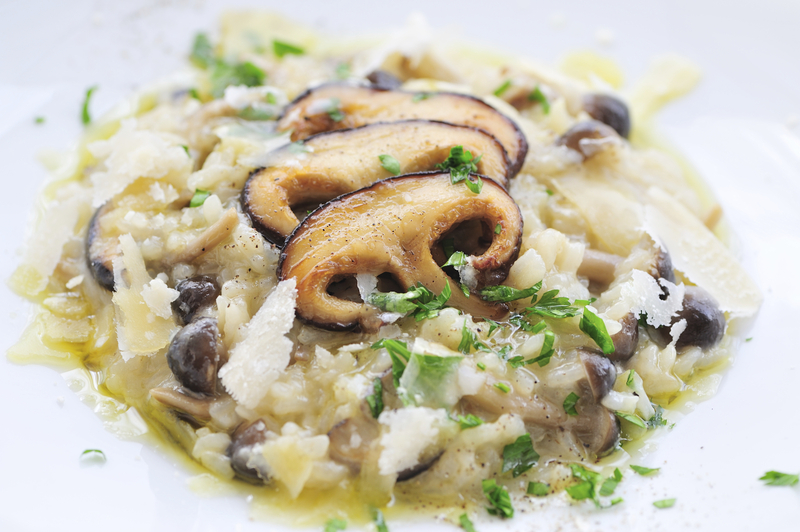 Stir into a basic risotto and finish with a small amount of truffle oil if desired. Onion-Sage – Adding a few fresh sage leaves and caramelized onions makes a risotto that pairs well with poultry and pork. Roasted Tomato – Slow roasted plum tomatoes or cherry tomatoes are hearty additions. Season with your favourite herbs such as oregano or basil. Butternut Squash – Roasted butternut squash or pumpkin with crispy sage leaves turn risotto into an autumn masterpiece. Seafood – Add your favourite shellfish such as cooked lobster, scallops or shrimp to risotto. Use shellfish stock in place of chicken stock and leave out the cheese. Asparagus – Add chopped cooked asparagus and season with a bit of lemon juice and zest for a delicious spring dish. Saffron – Soaking a few strands of saffron in the chicken broth makes a traditional Risotto Milanese.